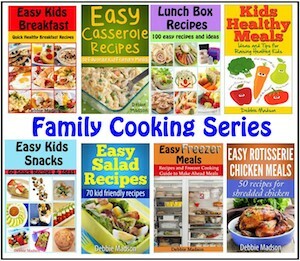 Easy meal ideas to make dinner faster and easier when cooking for kids. We have some easy meal ideas and tips to help because we all know having kids leaves little time for preparation during the stressful dinner hour! At dinnertime children are tired and hungry (and so are you! )and the last thing you or they want to do is wait. How can you cut down the stress and get dinner done faster and easier? I have some easy meal ideas for you to get started making dinner time less stressful. The key to easy meals is to be organized and have a plan. Not sure how to do this? Preparing ahead of time is the key to easy meal ideas! Preparation goes a long way with kids! Start early! The less work during the stressful dinnertime the better. To make dinnertime quicker, during the day when they are busy playing, in school, during nap time or anytime you have a few minutes, do your prep work. For example, if making sweet and sour chicken cut meat into cubes, cut up veggies and make sauce. Then put each in a separate bowl and store in the fridge until dinner. Do this with all your recipes. Look your recipe over and see what can be done ahead of time. Many dishes can be assembled and then refrigerated until dinner time. Even many side dishes can be done ahead of time like salads. Another option is prepare all your vegetables and meat once a week after shopping. Do all your prep work once and store the meat and vegetables in the freezer or fridge. Carrots and celery can be cut into sticks and placed in a bowl of water. Meat can be cut into cubes if needed and wrapped in tin foil or a ziploc bag. Then placed in the freezer. I find it is easier to save the harder, longer preparation meals for weekends when I have more time and my husband is here to help (whether in the kitchen or with the kids). Shop once a week and have a menu planned out for each night. This will save you from last minute shopping trips. When you know what's for dinner each day your dinner preparation will save you time and make for a quicker dinner. After dinner is over and cleaned up think about the next night. What needs to be taken out of the freezer, bought at the store or prepared early the next day? A little preparation goes a long way when it comes to incorporating easy meal ideas. The crock pot can be a great easy meal idea. I just love mine. I have a larger one that can cook a whole roast chicken or double batch of soup and a smaller crock pot. Try at least once a week to use your crock pot especially on your busiest day. Put your freezer to work! Freezer meals can help immensely. Many recipes can be doubled or tripled and half stored in freezer containers for another day. Once a week have a chef's night off. Buy a rotisserie chicken, frozen pizza (you can even make your own ahead of time and freeze), visit the salad bar or eat out. These nights can be a much needed break for the head chef and leaves you geared up to cook again the next day. Take advantage of the convenience items at the store such as frozen chicken breasts, frozen vegetables, bagged salads, cut up grilled chicken. Just double check they are healthy convenience items not the meal in a box type that are high in salt and fat. Keep your kitchen organized and the cupboards well stocked. If you want to get dinner done quick you need to have everything on hand and know where to find everything in your kitchen. Don't waste your time searching for your favorite saucepan or spatula. Learn what to stock in your kitchen? Help your child be in charge of dinner with these easy dinners. Have a well stocked and organized kitchen. Everything runs smoother if it is in the right place and you have all ingredients on hand. A weekly or monthly menu plan. A little preparation of what is for dinner or even a simple list will help you be prepared for what is for dinner each night. Think about it once and then forget about planning for awhile. Simplify your meals don't spent 2 hours on one meal. Keep a record of what meals were a success. Think about what's for dinner the night before, what you need to un-thaw, prep and get ready for the next day. Even if you are extremely busy try to sit down and eat together as a family every night. Have fresh vegetables and fruits on hand for healthy side dishes, salads or fruit platters. Organize your recipes. Make a 3 ring binder or recipe cards of at least 14 of your families favorite meals. 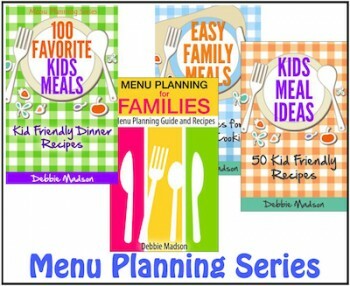 This will be a great starting point for easy meal planning. One of my favorite easy meal ideas is to prepare your meat and vegetables for the week after you grocery shop. Some vegetables you can't prep ahead but celery and carrots can be cut into sticks or chopped and placed in water. Just drain off water or take out what you need when you are ready. Lettuce can be washed, spun dry, wrapped in paper towels and placed in a ziploc baggie. Cut meat in chunks or strips whatever you will need for the week. You can also marinade meat, place in baggies and freeze. Try a salad and sandwich night, for an easy idea. These tips came from the Betty Crocker 2007 calendar which is no longer available online. Eliminate cleanup by using tin foil packets to grill your food. Use individually frozen chicken breasts, pork chops or fish fillets from the freezer section. When ready to cook remove the number you need. Don't rinse your pasta after cooking as sauces will cling better. Cube leftover chicken, turkey, ham or beef and freeze in 1 cup amounts. Use them to toss into salads, soups or casseroles. If you make chili the day before and let the flavors mix it will taste better. Bake meat loaf in mini loaves and it will bake faster. Serve dinner buffet style from the slow cooker. Make a double batch of casseroles or cookies and store in the freezer until you need a quick meal. When checking out at the grocery store bag perishables and non-perishables separately to make unloading easier. Cook one dish meals where everything cooks in one skillet or baking dish. Combine honey and mustard in a baking casserole dish. Stir in basil. Coat chicken breasts in sauce on both sides. Cover with foil and bake at 350 degrees for 30 minutes or until chicken is well done. Preheat oven to 425 degrees. Meanwhile. Spray or lightly grease 13x9 casserole dish. Add stuffing to a shallow bowl. Stir in melted butter and combine. Coat both sides of fish stuffing crumbs. Lay fish in casserole dish. Drizzle with lemon juice. Place the remaining stuffing over the top of the fish. Bake in oven for 18-20 minutes until fish flakes with fork. In a casserole dish place chicken breasts. Brush chicken with barbecue sauce, add cheese and allow to melt. Place a cooked bacon on top. I've also cooked the chicken on a George Foremon grill and it has turned out even better. Cook pasta according to directions. Meanwhile ground beef and stir in chili powder. Drain and add into soup pot. Stir in tomatoes, chili beef soup and cooked macaroni. 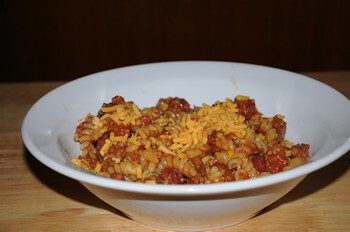 Warm and serve each bowl of chili mac with cheddar cheese. Share your easy meal ideas and recipes! Thanks to our awesome readers! We really enjoy hearing from you and learning about your cooking experiences. "This is what I've been searching for." Feel free to send us your favorite kid recipes and kids cooking ideas. We love to share them! Thanks to SBI for making building my website so easy and enjoyable!